News TV Channel / WAFB is the CBS-affiliated television station for Baton Rouge, Louisiana. It broadcasts a high definition digital signal on VHF channel 9 from a transmitter southwest of Arlington. Owned by Raycom Media, WAFB is sister to Class A MyNetworkTV affiliate WBXH-CD. The two share studios on Government Street in downtown Baton Rouge. 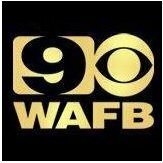 On cable, WAFB is available on Cox Communications channel 7 in standard definition, and in high definition on digital channel 1007, as well as on AT&T U-verse. The station is also seen on DirecTV and Dish Network.